Nearly 60 percent of guns recovered in Chicago come from out-of-state dealers, with more than 20 percent traced back to Indiana, according to a newly released report on the city’s violence. The 2017 Gun Trace Report released Sunday also showed that nearly a quarter of the guns recovered in Chicago were sold by just ten federally licensed firearms dealers (seven in Illinois and three in northwest Indiana). The report is part of a collaboration between the Chicago Police Department, Mayor Rahm Emanuel's office and the University of Chicago Crime Lab. The report analyzed data from crimes between 2013 and 2016 to better understand where guns in Chicago come from, and to help officials develop impactful solutions to address the root causes of the city's violence. Chicago police have recovered nearly 7,000 firearms annually since 2013 that were used or suspected of being used in a crime – far outnumbering other major metropolitan areas, according to the report. When adjusted for population, authorities in Chicago recovered six times as many guns per capita as their counterparts in New York City and 1.5 times as many as in Los Angeles. The top two sources of firearms recovered by police – Chuck’s Gun Shop in Riverdale and Midwest Sporting Goods in Lyons – have been the source of a disproportionate number of weapons for the better part of a decade, according to the report, providing a combined 11.2 percent of all crime guns recovered in Chicago. When reached, a spokesperson for Chuck's Gun Shop declined to comment. In a statement, Midwest Sporting Goods said the data in the study "seems exaggerated" and that the shop "seeks to work with the authors... to seek real solutions." Midwest Sporting Goods also said that in response to the 2014 Gun Trace Report, it implemented provisions outlined in the "model gun dealer ordinance" and has complied with the Village of Lyons ordinance requiring them to maintain a "do not sell" list of customers whose weapons have been traced to a crime. It was not immediately clear what others provisions laid out in the model gun dealer ordinance, which calls for background checks, inventory record keeping and audit requirements to aid law enforcement, and video camera recording of gun sales and inventory areas to deter straw purchasers and thefts, that Midwest complies with. The report cites the Lyons ordinance to show that stronger local regulations of gun dealers can reduce the number of weapons entering the market quickly and illegally. "From 2015 to 2016, Midwest Sporting Goods’ shortest time to crime gun recoveries – those of less than one year from point of sale to recovery in a crime – dropped by almost 10 percentage points," the report noted, adding that though more time and analysis is needed, "early results are promising." 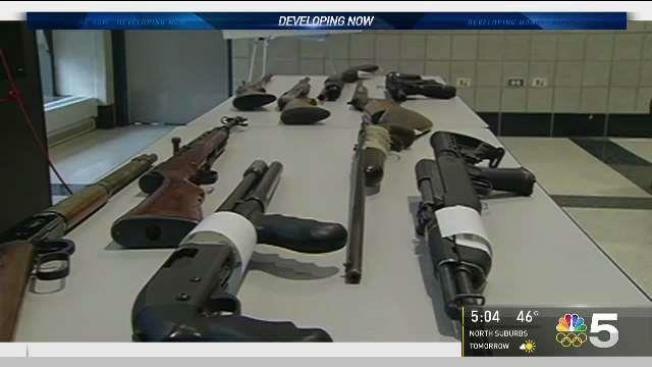 The report also underscored the impact policies in other states have on guns trafficked into Chicago. Sixty percent of firearms recovered by police originated from a dealer outside Illinois, research showed, with one out of every five guns coming from Indiana. Weapons recovered in Chicago were also traced back to Mississippi, Wisconsin, Ohio, Kentucky, Georgia, Tennessee, Alabama and Texas, according to the report. The vast majority of crime guns were handguns possessed by adults who were not the original purchaser of the firearm, the report says. But, it noted an uptick of juvenile offenders has trended upwards over the past four years – from nine percent in 2013 to nearly 13 percent in 2016. To that end, the report identified four major policy proposals to be enacted at the state level, as well as several federal solutions. First, the report urges Illinois lawmakers to pass the statewide Gun Dealer Licensing bill, legislation that mirrors provisions in the model gun dealer ordinance. The legislation will is slated to be considered during veto session next week. A day after declaring "Chicago needs help!" 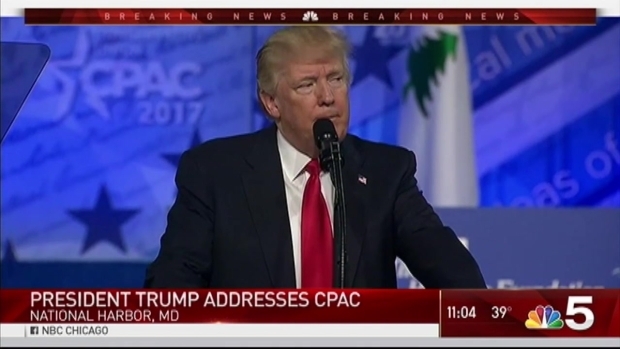 on Twitter, President Donald Trump referenced Chicago's violence Friday in an address to the Conservative Political Action Conference. The report's second area of focus is comprehensive background checks on private firearm sales. Both federal and state law require background checks at licensed dealers, and Illinois also mandates that all sellers, regardless of setting, check a person's Firearm Owner's Identification (FOID) card prior to completing the transaction. However, private sellers are exempt from penalty for failing to verify a buyer's FOID card ahead of the sale - a policy the report urged lawmakers to address, particularly in light of an audit this year that found that just 30 percent of revoked FOID cards are actually returned to Illinois State Police. Specifically, the report asks legislators to institute a mandated background check before all firearm sales, and to tie a criminal penalty to all sellers who do not verify a buyer's FOID card. Third, the analysis seeks more effective enforcement and harsher punishment for violations of Illinois' "lost and stolen reporting" law, which requires reporting a firearm's loss or theft "within 72 hours of obtaining knowledge" of the incident. Failure to do so is a petty offense under the current law, which researchers said was too lenient. They suggested instead that a violation should make an offender eligible for arrest and possibly for the revocation or suspension of his or her FOID card as well. Last — but certainly not least in terms of complexity — the report calls for a firearms registration system. The report said having a way to track lawful firearm transfers before a weapon enters the secondary illegal market would "provide an invaluable tool" to detectives in criminal investigations. Current federal law requires keeping records of a firearm's initial sale with the ATF, but without a way to track subsequent sales, tracing the full path of a weapon used in a crime remains difficult. Calling Chicago "uniquely vulnerable to interstate firearms trafficking due to surrounding states with weak regulations," the report also identified several possible solutions outside Illinois, at the federal level. Many of those suggestions were set forth in the first iteration of the report in 2014, including a collaborative effort among Midwest law enforcement agencies, an increase in ATF resources, comprehensive background checks on all firearm sales regardless of venue, regulation of online transactions, and more. More than 3,100 people have been shot so far this year in Chicago, according to the Chicago Tribune, and nearly 600 homicides have been reported. Those numbers represent a decrease from 2016, a historically deadly year for the city. The Gun Trace Report is the second report of its kind. The first, published in 2014, analyzed data compiled from 2009 to 2013 to recommend policies and regulations to help combat illegal gun trafficking and associated violent crimes.